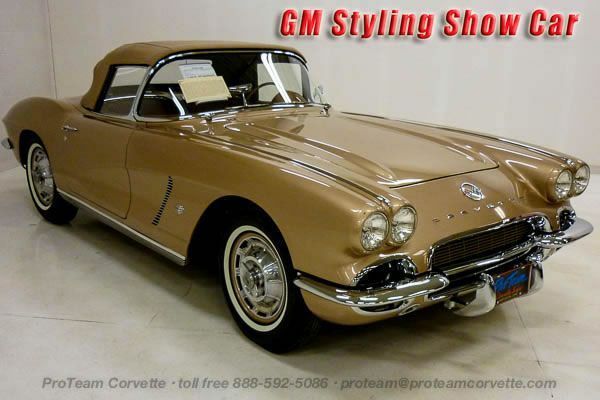 The General Motors Styling Department conceived a handful of factory-experimental Corvettes for important people and special occasions throughout the 1960s. 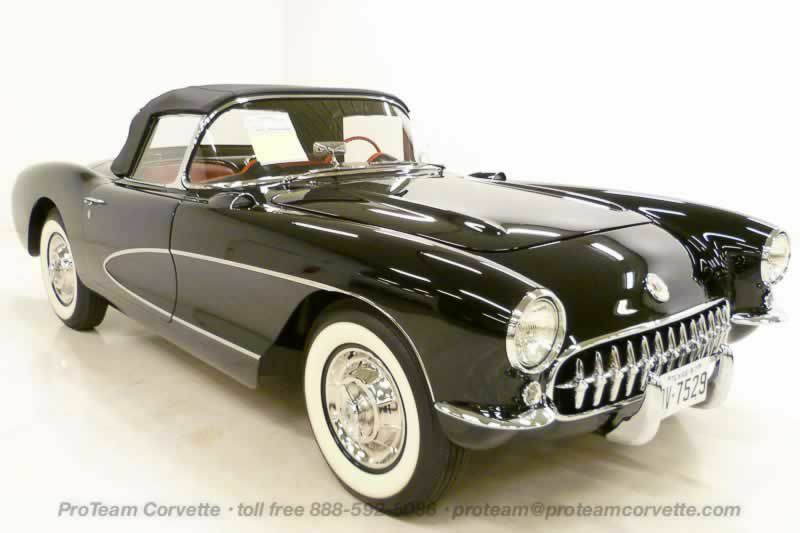 Identified by their Shop Order numbers, a few of these distinct cars were built for GM luminaries such as Harley J. Earl, Bill Mitchell and Semon “Bunkie” Knudsen—or in the case of this 1962 Corvette Styling Car with Shop Order 10224: Chevrolet’s 50th Anniversary. Chevrolet celebrated its “Golden” 50th Anniversary in 1962 with a special paint scheme on the ’62 Impala in Anniversary Gold with Yellow-Gold interior. Unknown to many Bowtie enthusiasts, Chevrolet actually experimented with the Gold-on-Tan color combination on a Corvette before offering the 50th Anniversary Impala as an option. Scheduled for November 15, 1961 production in St. Louis, this Corvette’s transformation was completed at GM Styling on January 16, 1962. Known within the Corvette community as the 50th Anniversary Gold-on-Tan “evaluation car,” the build date precedes the February 1962 Chicago Auto Show, from where rumors spread of a Golden Corvette on display for Chevrolet’s 50th Anniversary. After the success of this styling exercise, Chevrolet had no choice but to offer a 50thAnniversary model in a special golden color combination. Corvette was considered, but high-level GM brass believed the full-size line would result in more sales, and subsequently an estimated 350 Impala 50th Anniversary cars were produced for 1962. The decision left in its wake this special one-of-a-kind Corvette Styling Car. Mounted on the firewall, the original GM Styling Shop Order tag was inspected by styling car expert, Werner Meier, and considered authentic due to its “crude patina” typical of original tags found on other styling cars. The tag reads “S.O. 10224, 1-16-62” and upon further examination, many components on the car were also identified by shop order 10224 including the original interior kick panels and spare-tire board that have the number applied in grease pen. With this information in hand, Bloomington Gold Great Hall inductee Terry Michaelis immediately acquired the special car for his family’s personal collection. A two-year forensic inspection by Fred and Terry Michaelis revealed evidence of Gold paint under the dash and behind the striker mounted in the door jamb and signs of Tan leather interior. The original paint color was matched based upon the wonderfully preserved section hidden from the elements under the door striker. Completed in 2010, the special Firemist Gold paint emulates the original and is complemented by an inviting Tan leather interior and matching Beige convertible top. Many original components replaced during the restoration were kept and will be included with the car. 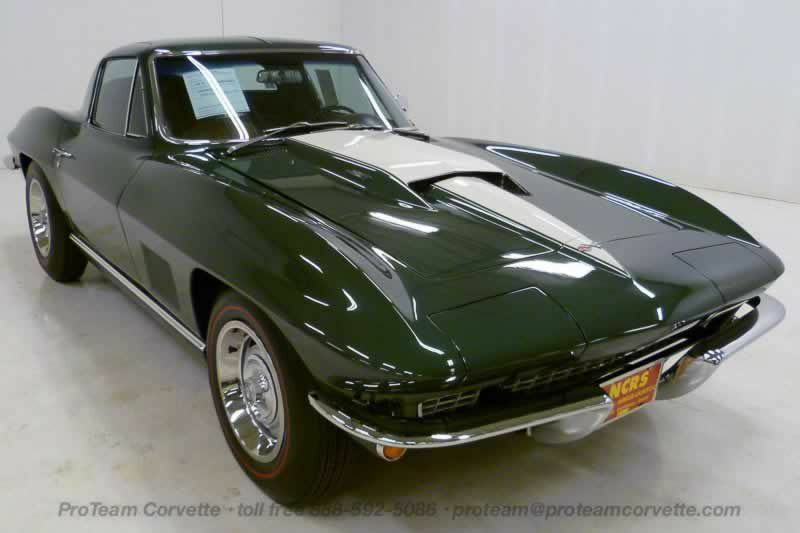 Recent research has unveiled a title history with ownership history traced to 1979 in Lansing, Michigan, and Michaelis visited the National Corvette Museum to view the styling records. Interestingly, S.O. 10224 precedes the pair of blue and pink 1963 Corvette Styling Cars built for Mr. and Mrs. Harley J. Earl by exactly 100 in sequence! This styling car’s elegant, “golden glow” captivates the crowd and a peak under the hood reveals its matching-numbers 327/300 HP small-block V-8 engine mated to a Borg Warner T-10 4-speed transmission and 3.36:1 Positraction rear differential. Subtle touches encompass a Gold anodized front grille and color-matched wheels behind the otherwise-stock wheel covers on Firestone Deluxe Champion 6.70-15 bias-ply white-stripe tires. Factory-correct components include the Wonderbar signal-seeking AM radio, sun visors, courtesy light, heater, spiral shocks, washer system, shifter, air cleaner and generator. This stunning 1962 GM Styling Corvette Show Car has been invited to multiple national concours events including the Eye on Design Automobile Design Exposition at the Edsel and Eleanor Ford estate in June 2011 followed by the Styling Car Showcase at the 17th annual Amelia Island Concours d'Elegance in March 2012. Accolades ensued with the “Class of 1962 Display” at the Muscle Car and Corvette Nationals in November 2012 and two invitations to the Ault Park Concours d’Elegance in 2013 and 2014. What Is My Corvette Worth? I get asked this question almost everyday. The value of a Corvette is directly related to venue, location, day, and time of day if offered at auction. 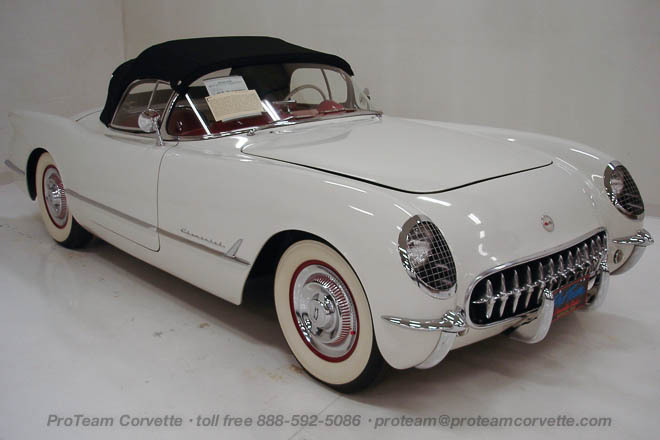 High profile collector car auctions offer maximum exposure and hundreds or thousands of affluent “ready to spend” registered bidders that like the auction excitement and instant gratification of making a purchase and thus outbidding others. In essence they are the winner! Auctions create urgency and unless bidders are prepared to bid that car is sold within 2 to 3 minutes. I have participated as both buyer and seller at most of the classic car auctions in the USA for over 40 years and know the process well. 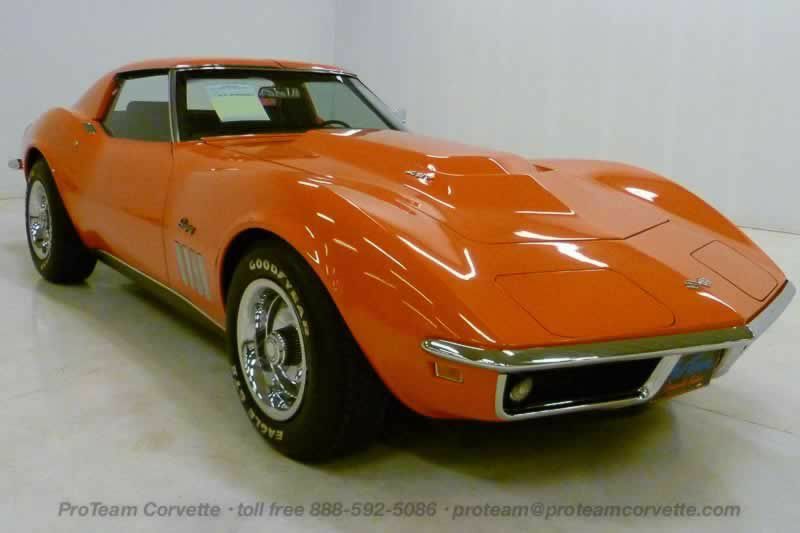 Contact [email protected] should you have a rare Corvette or Corvette collection and need advice as it relates to estate planning, estate resolution/liquidation as it relates to auctions and/or outright purchase.